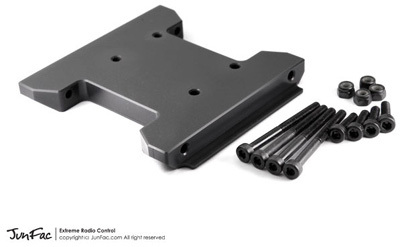 JunFac R1 Delrin Skid Plate Discounts Apply ! Delrin skid plate wraps under the side plates to help you slide over the rocks better. This skid moves the links to a triangulated inboard position. Mounting the links inside the chassis plates gives the bottom of the chassis a smooth edge to slide over rocks. CNC Machined from solid billet delrin with exceptional quality and easy installation. What's included: Delrin Skid Plate x 1 and Installation Screws & Nuts. Made for the Gmade R1 rock crawler.